The eponymously free MMOG, Free Realms, has garnered over 9 million registered players, according to Sony. Free Realms launched in April 2009 under a free-to-play business model. Sony has announced that the kid-friendly MMOG is doing quite well, with over 9 million registered players. Free Realms combines MMOG play with an array of minigames, new features such as riding a dragon, and a convergence with a trading card game. There is no word on how many of the 9 million players are currently active or whether they are generating any revenue through micro-transactions of in-game items. 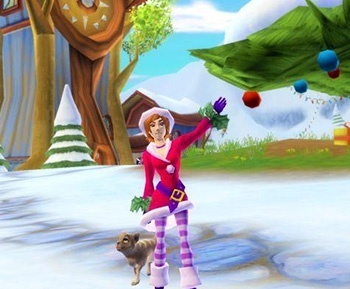 But John Smedley, president of SOE and one of the designers of the original EverQuest, is confident that with all of the new features Sony is adding to Free Realms that the money train will soon come in. "With Free Realms, we've been able to reflect the needs and wants of our players by keenly listening to their suggestions and feedback," said Smedley. "We believe the persistent exercise of capturing in-game research inside Free Realms has been a huge contributing factor as to why we've attracted over nine million players in less than a year. It truly helps us give our players a game where they can do and be whatever they want." It's clear that Free Realms is attempting to compete in the free-to-play MMOG field currently ruled by RuneScape. But with RuneScape's 156 million registered accounts and 10 million active players per month, Sony has a long road ahead if they want to unseat the king with Free Realms.